Capt. Holt returns to the precinct, just in time for this year's Halloween (HALLO-WEEEEEEN!) heist. This will be a decisive year, since Holt and Jake are currently tied at 1-1 over the past two seasons, and there's a new twist: Instead of Jake stealing something of Holt's, they're each putting together a team to go after the same prize -- a golden crown that will anoint the winner as King of the Nine-Nine. The NY Magazine culture blog Vulture (not the Vulture) talks to Andy Samberg about this year's Halloween episode, tackling real-world themes on B99, and other topics of interest. As soon as Jake and Holt started spurning Amy I knew she would end up with the crown, but it was still fun to watch her pull off the perfect heist. Loved the stinger, too. "No.....noooo!" I didn't figure out where it was going until we saw the suspiciously feminine-looking janitor in the security footage, but in hindsight it was a pretty obvious setup. For me the joy is less in the surprise twists and more in just seeing how everything plays out in Rube Goldberg fashion. My only criticism was that the episode could've been a bit more Halloweeny -- the opening stinger gag with everybody in their costumes (Terry as Popeye!) was all too brief. Similar to the reveal in Mr. Robot, I don't care if I see it coming so long if it's done well. Amy's win felt totally earned. Hitchcock and Scully dressed up Mustard and Mustard warmed my terrible little heart. I figured it would be Amy, but then twisted myself out of it by decreeing that as too obvious, and that either Rosa or Gina would end up being the mastermind. By the way, did anyone else get an anti-smoking commercial immediately after the smoking scene on the roof? I just remembered Rosa's expression as she stalked out of the precinct carrying a gigantic knife and was delighted. I LOVED how Amy kept it real throughout and didn't hide how pissed off she was at both Holt and Jake. And then achieved perfect victory over them. Them not being afraid to write the women characters as their own people is one of my many favorite things about this show. And as a plus, Gina wasn't even completely unbearable! bleep, you are a stone-cold atrocity. Terry: "Drinking a soda pop isn't the worst thing in the world." Holt: "It is the worst thing in the world. Worse than a fruit-forward Rieseling." I love how Holt is coming out of his shell. He started off unable to trust anyone--he'd spent so long the victim of such terrible prejudice that he couldn't let his guard down. But now that he knows his colleagues respect and like him, he's able to have some fun. He's still Holt, of course, but now he's Holt who can laugh along with Jake and the crew. I.... I just really, really like Holt. "Because the cleavage cloaks the camera with its curves." Because he already has 10,000 Emmys he should have won for playing Det. Frank Pembleton on Homicide. why can't you envision a world where he gets both? Because 20,000 Emmys is just ridiculous. There's also all those Emmys he should have won for Men Of A Certain Age. 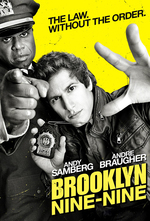 Why hasn't Andre Braugher won 10,000 emmys for this already. I guess the Emmys committee just has some sort of weird hang-up about engraving VELVET THUNDER on the award plaque. Braugher's delivery of this line nearly killed me dead. It is a Homeric epic.